The UO’s Museum of Natural and Cultural History has a mammoth affair on its fall calendar. 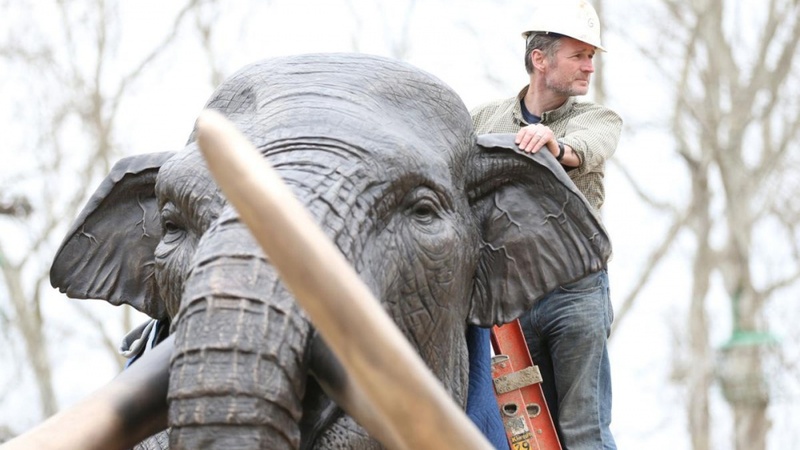 In early October, the museum will unveil two life-size Columbian mammoth sculptures in its courtyard. Constructed of steel, resin and fiberglass, the monumental works will depict an adult female standing more than 12 feet tall, with her young calf trailing closely behind. Created for the museum by Missouri-based artist Gary Staab, the soon-to-be completed sculptures will begin their journey from Kearney, Missouri, to Eugene in late September. Staab is known for blending science and art to bring extinct species back to life. With the help of fossil casts, 3D scans and stacks of paleontological literature, he has created replicas ranging from 75-foot-long dinosaurs to the 3 million-year-old human ancestor known as Lucy. His works have appeared at museums around the country, including the Smithsonian Institution, Houston Museum of Natural Sciences, Denver Museum of Nature and Science, and the Indianapolis Children’s Museum. One of the largest mammoth species, Columbian mammoths roamed Oregon until their extinction around 13,000 years ago, a time when most giant ice age mammals disappeared from North America. Debates continue about the possible causes of those extinctions, but most scientists point to a combination of climate change and hunting by humans. Paleontological research at the museum has recently zeroed in on the Columbian mammoth, with ongoing studies of one herd’s footprints uncovered at Fossil Lake in south central Oregon. The footprints, dated to 43,000 years ago, were discovered by Greg Retallack, director of the museum’s Condon Collection of Fossils, while on an exploratory field trip in 2014 with six UO students. Jon Erlandson, the museum’s executive director, said that the sculptures reflect those research directions and are fitting ambassadors to a museum that uses science to bridge the past, present and future. Museum members, campus leaders and other invited guests will be able to meet the artist during an exclusive preview of the new sculptures Friday, Oct. 5, at the museum. On Oct. 6 and 7, the museum welcomes the public to A Mammoth Celebration, a weekend-long event featuring a meet-and-greet, talk and “paleo-sculpting” workshop with Gary Staab on Saturday. On Sunday at 1 p.m., Retallack will discuss the Fossil Lake mammoth trackway and what it may reveal about family dynamics in mammoth herds. Throughout the celebration weekend, visitors will be able to examine mammoth fossils and replicas, browse commemorative mammoth items in the museum store and offer ideas for what to name the new additions. Admission, workshop registration and other information are available on the museum’s website. Nearly two years in the planning, the mammoth installation is made possible by hundreds of contributions from museum supporters, many of whom gave directly to the project during #DucksGive 2017, the university’s second annual giving day. Other key players include UO Campus Planning and Facilities Management and Cameron McCarthy Landscape Architecture and Planning, which collaborated with the museum to develop a site plan and design new pathways and other features. In addition to the mammoth sculptures, the museum is revamping its courtyard with an enhanced native plant display. Donated by Rainbow Valley Design and Construction, the new planting design features plants that have been used by Willamette Valley peoples for thousands of years. The revamp also includes new interpretive signs accompanying the Willamette Meteorite and the hammered copper salmon, wolf and other totems that sit atop the museum’s outdoor porticos.